After only the bare fortnight, Newbridge or Nowhere has already become a rallying cry for the dispossessed. I have been railing here for years about the the playing of games in Croke Park, as a default, at every available opportunity. Does anyone at all in high places read the column? I know now how the young Nostradamus must have felt when all and sundry ignored his predictions. I'd say the poor man was only dying for earthquakes, pestilence and world wars. 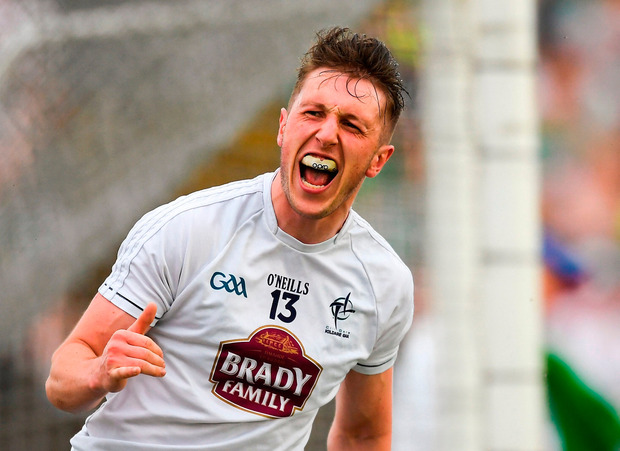 Kildare beat the system and had another big win over Fermanagh on Saturday. The most GAA county of all is enjoying a long hot football fest of a summer. Defiance unites and Kildare are a team at last. Mayo were sent on a journey to hell when they were knocked out of Connacht, but the team that never give up are far from finished. There's at least another year left in the likes of Keith Higgins and Andy Moran. Mayo will come back stronger and rested. This will be their first summer off in years and the sabbatical will do them no harm at all. The rules, though, are a farce. Mayo have spent more time on the road than Marco Polo. The adoption of the rules of fair play, which do not always correlate with the GAA laws, would have ensured a neutral venue. It is not fair that the venues for games should be decided by chance. This anomaly seems to have been forgotten in the rush to repatriate Kildare, who hadn't a home game for years. If Kildare were in a lower division than Mayo well then they would have been entitled to a home venue, as of right, without any need to spin the wheel. So you play in all kinds of muck and puddle in the wilds of winter and somehow manage to keep up in the high divisions, only to be told your county team has to play away in the Championship. The team with the better league record has to play away. Can you imagine the scandal if the Minster for Education brought in a CAO system whereby the first choice for college places was given to those on the lowest points? Neutral or Nowhere then, and that neutral should have been anywhere but Croke Park, the Switzerland of Ireland. Rip Van Winkle woke up after a feed of drink and wondered what went on while he dozed off. Ah, but Rip Van Dublin are heading for four in a row at a rate of knots and we all fell asleep on our watch. Well Rip, Donegal finally realised they have been shafted, a week before the game against Dublin, even though the rule was made months ago. Dublin, who only very rarely have to travel, are given a home game in a neutral venue. This is absolutely hilarious. And they all voted for it at Congress. Could the reason be the delegates foresaw a big loss in revenue coming down the line? There must be an open and honest debate. Is it all about money? The GAA are spreading out the games. Navan was buzzing all weekend. I was told the playing of the matches in Páirc Tailteann was like a festival for the town. I got a drive up the Shannon one time in a helicopter from a pal who did well. There were some small places that didn't have a shop, family pubs were boarded up and there was no sign of a church in the more pagan parishes, but every single village owned a GAA field. The GAA do so much good. After all, kids have been allowed into the big games for a fiver up to now. The majority mean well and work so hard, but allowing Dublin to play All-Ireland semi-finals at home is also a crime against fair play. Thurles and Cork can hold huge crowds. The new President of the GAA John Horan moved quickly to promise a review of the anomalies. He did well, but now he needs to move his own county out on the road. Not easy for him, but right must prevail. I hope this is not being viewed as anti-Dublin. The decentralisation proposal has nothing to do with the Dublin team. The playing of a home game a couple of buses away from your home ground is not a problem of Dublin's making. I am all for the pouring of money into coaching in Dublin. It's all about the kids. A child playing hurling and football forgets their cares and worries out on that pitch, in times when the sanctity of childhood was never more under threat. I believe the partitioning of Dublin would be a crime against tradition and the unity of the city. I checked and no columnist anywhere has praised this Dublin team more than I have, but there are injustices which must be rooted out. The GAA gets an E in geography. Kerry play Galway next weekend in the neutral venue of Croke Park. What's wrong with Limerick and the Gaelic Grounds? Limerick is close to Kerry and you can get from Galway city to Limerick on the new motorway, thanks to Brian Cowen, in about an hour and 15 minutes. Croke Park is like some sort of sacrificial Inca altar where all must suffer, so the great god Mammon will be pacified with a soother dipped in molten euro. Money is not the makings of anyone or any sport. The GAA must adopt an official policy on decentralisation. The fans will stop for a drop of petrol, a bite of food, a sleepover, and a Shane Ross Shandy - 10 parts lemonade and one part beer. Croke Park is a national treasure, the GAA is Ireland and of Ireland, but we have lost our way. Right now, all roads lead to Dublin.